I realized as I was writing this post that this would be my 500th post on TechCommGeekMom. Who knew that so much information and thought could accumulate through original posts and curated content? I’m also very close to my all-time 15,000 hits mark (only a few hits away at this writing). I wouldn’t have believed you if you told me that I’d hit these benchmarks when I started this blog, but of course, I’m going to keep going! I debated about what I should write for my 500th post–whether to finish my Adobe Day coverage or do something else, and in the end, it seems fitting to finish my Adobe Day coverage, because in many respects, knowing and writing about the presentation of Scott Abel, aka “The Content Wrangler”, shows how far I’ve come already in my tech comm journey from beginner to covering internationally known presenters. Scott is one of the most prolific and vocal speakers out there on the conference circuit speaking about content–whether it be content management or other technical communication topics. It also seems like he has written the forewords of many of the best tech comm books out there. He’s everywhere! To boot, he’s an accomplished DJ, and I found myself “bonding” with him over dance remixes and mash-ups while at Lavacon, because I always enjoy when he posts either his mash-ups or his favorite mash-ups on Facebook. (I’ll be writing a post about the relationship between tech comm and dance mash-ups in the near future.) He is a person who is full of so much kinetic energy that you wonder when he’s going to explode, but he doesn’t. Even the time I saw him at the STC Summit last spring with a bad cold, he was still more on top of his game than a lot of people would be on a good day. Much like Val Swisher, my love for all things Scott Abel also knows no bounds. He knows how to stir things up at times, but there is no denying that in his frenetic pace of delivering a presentation, you learn SO much. I’m lucky that he’s so kind to be one of my cheerleaders! So when it came to thinking of a garden in Portland to use as an analogy to Scott, I had to deviate. 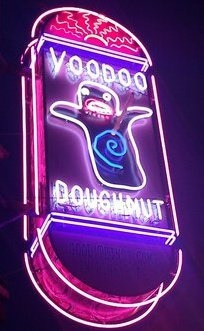 In my mind, he’s the Voodoo Doughnuts shop located about four or five blocks away from the Chinese Garden. Scott’s talks always have lines going out the door, and like many of the Voodoo Doughnuts themselves, the unique flavors dispensed open your mind up to new and delicious possibilities and ideas, and you come back wanting more (hence, more long lines!). They are both crazy and sweet at the same time. You can’t beat that combination. 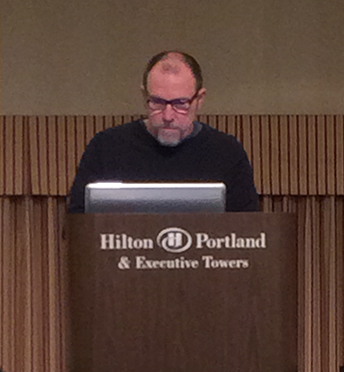 Scott was the keynote speaker for Adobe Day as well as the moderator of the discussion panel later in the event. Scott’s topic for his talk was called, “Five Revolutionary Technologies Technical Communicators Can’t Afford To Ignore.” If Joe Gollner went fast during his presentation, then Scott went at lightning speed, so my notes below are the highlights. Scott started by telling us that translation is going to be an important part of automated content going forward. It’s important to understand that for the web, the World Wide Web (WWW) is equal to the “land of opportunity.” The WWW can reach a global market reaching new consumers. As American users, we forget that 96% of web users are not in the US. We don’t all speak English globally. In fact, less than 6% of the global population speaks English well, but don’t necessarily read or write it well. Why would be need automated translation? We write for the *worldwide* web. There are over 6000 languages in the world, so translation is a big deal for a global reach and global connection. We need to recognize that content is written for both machines and humans. Even though we write for both machines and humans, we need to write for machines first, as they are the “gatekeepers” of content, such as for searches. Everything goes through the machine first. We need to recognize that writing rules learned in elementary school are no longer sufficient for a world in which language science is needed. We need to examine our content from the vantage point of a rules-processing engine and ensure it’s optimized for machine translation. Automated transcription involves software that translates speech to text for machine use. Without transcription, content is locked and hidden from view. Transcription allows for better searchability of content. Scott recommended Koemei as a good transcription software tool for video and general transcription, as it can help transform editable content into other languages. Terminology management controls words in a central place, namely the words used the most and used consistently for branding, products, etc. Terminology management is important for consistency as well as for regulatory reasons. This is an instance where seeking a global content strategist is needed to help standardize processes. It’s best to adopt a terminology management system, such as Adobe partner and Scott’s suggestion, Acrolinx. Adaptive content is content that is structured and designed to adapt to the needs of your customer; it’s about substance of the content. 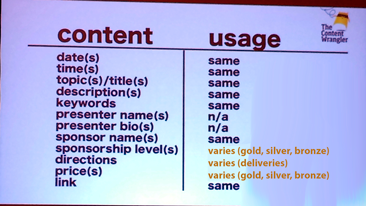 Adaptive content adapts to the devices, e.g. laptops, GPS, and smartphones. Customers are demanding exceptional experiences, so we need to meet their expectations, so it’s up to responsive designers to meet that challenge. Adaptive content makes it possible to publish to multiple platforms and devices. It is content separated from formatting information. By allowing authors to focus on what they do best, adaptive content makes content findable and reuseable by others who need it. We need to rethink content, as the move to adaptive content involves work, but the ROI (return on investment) can be realized in months instead of years. 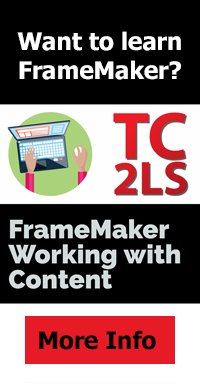 Component content management systems are needed. They focus on the storing of content components that are used to assemble documents. Components can be in all sizes, and can be photos, video, and text. 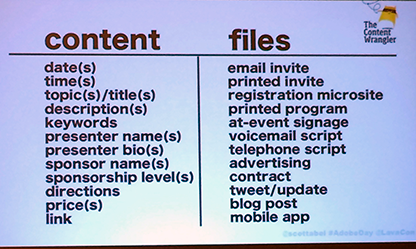 It’s about managing CONTENT not FILES. Structured content, combined with a component content management system, supports personalized content and targeted marketing, which in turn increases response rates. In this end, this process can save money! The key is to remember that all customers are not the same! Reusing content without the “copy and paste” methods produce the best results. You can ensure that content is consistent by seeking a content strategist who understands content and is a technologist. Implement a component management system. Scott suggested checking out Astoria Software for a good component content management system. At this point, Scott’s talk had pretty much finished, but in answering audience questions, he pointed out that there’s a lot more than just these five technologies to watch. He suggested that we should look out for wireless electricity, flexible surfaces, more wireless devices, wearable computing, and augmented reality as well. He also said that in order to mature as a discipline, we need to be content craftspeople, content designers and content engineers. We need to leverage using content and code. We need to think more like engineers, and less like writers and editors. Even websites that are very localized still need to be written for global purposes to improve the English used for the native speakers as well. Controlled vocabulary helps all end users! Scott posted on Twitter than his presentation was available on SlideShare, but I have it below. And as always–Scott, if I misinterpreted or misquoted any of the information I summarized above, please let us know in the comments! This entry was posted in Uncategorized and tagged Acrolinx, adaptive content, Adobe, Adobe Day, Adobe FrameMaker, Adobe RoboHelp, Adobe Technical Communications Suite, automated transcription, automated translation, CMS, component content management, Content management, content management systems, content strategy, digital literacy, English, English language, Facebook, Framemaker, Google, iPad, IPhone, Joe Gollner, Koemei, machine language, machine translation, managing terminology, mobile, responsive design, reusable content, reuse, reuse content, RoboHelp, Scott Abel, single sourcing, singular experience, smartphones, tech comm, tech comm software, TechCommGeekMom, Technical communication, technical communications, technical writing, terminology management, transcription tools, Twitter, Voodoo Doughnut, World Wide Web, Worldwide web, www. Bookmark the permalink.